Forty young scouts and guides were injured when returning from a camp in Muak Lek, Saraburi. Their bus overturned after hitting a pick-up. The bus driver has been charged with negligent driving. Two of the girl guides, aged 12 and 13, were seriously injured. The remainder of the children suffered minor injuries. All were initially treated at Wang Muang Hospital but twenty were later transferred to Phra Phutabaht Hospital. There were 65 people on the bus. The children and their teachers were returning to three schools in Ayuthaya province after a three day camp. The bus driver, Surachart Art-siri, said that the brakes failed and he could not control the vehicle. He hit a pick-up coming in the opposite direction before the bus flipped and crashed into trees. The driver of the pick-up, Jakkrit Pattasingh, had to be cut from his vehicle and was then taken to hospital. Surachart was arrested and charged with negligent driving causing injury. 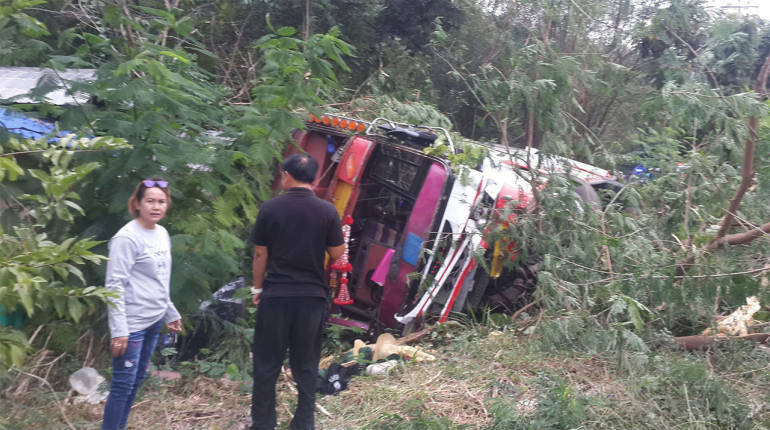 The accident happened on the Wang Muang – Muak Lek Road.